I’d probably be a little bit embarrassed if you saw my office right now. Whether it’s the variety of “assorted papers” stacked around the desk or the dust that is hiding behind the monitor, my desk is a far cry from the little girl who wanted a filing cabinet for her birthday. Oddly enough, though, once the papers end up in one of my filing drawers, things are quite organized. All of my bills are neatly sorted by type, and I cycle the old bills out every year and store them neatly in a box marked with the year. If you don’t have a filing cabinet, I suggest you get one. It doesn’t have to be one of those huge floor to ceiling cabinets. One of these mayline filing cabinets would probably do quite nicely. The trick is finding the cabinet that suits your style and the amount of papers you need to file. I also tend to move my desk around frequently, so I personally like ones that have wheels on the bottom. 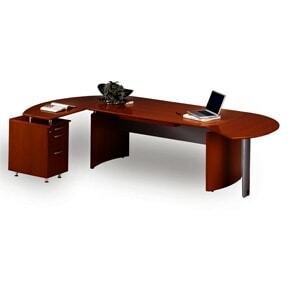 Another option could be to update my desk to a new mayline computer desk. When it comes to desks, I’m all about an L-shape. I can set-up my littler corner and just twirl the chair if I need to get something. Plus, it will give me plenty of workspace for my blogging set-up…although that might also mean more room for me to spread my “organized” chaos all over. LOL. LOL. Space is definitely key. I feel so cramped sitting at little desks. I need ROOM! I would like to say that the more space I have the more organized I am but I think it’s the opposite. The more space the bigger the mess!